Before Pan American Airways (PAA) Pacific Clipper Service began in November of 1935, there was no airmail route over the Pacific Ocean. This first Pacific air route was designated FAM 14 (Foreign Air Mail route 14). In July of 1940, Pan Am opened a ”Southern Route” from San Francisco to Auckland, New Zealand. This route was designated FAM 19. There was now trans-pacific airmail service to the Orient and to the South Pacific - including New Zealand and Australia. When Italy entered the war in June of 1940, all existing airmail routes over the Mediterranean were effectively closed. 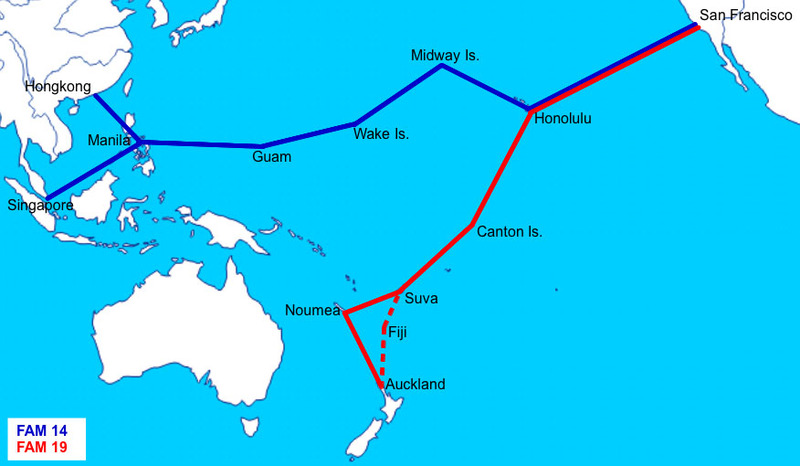 This created the need for an ”alternate safe route” to connect countries in Western Europe with nations in Asia, the Middle East, Africa, Australia, and New Zealand. From the start of World War II until the Japanese attack on Pearl Harbor on December 7, 1941, the Pacific Clipper service connected businesses and people from a vast number of nations on six continents. Because the service was expensive, covers are often franked with high face value stamps, otherwise seldom seen on cover. This collection presents the development of the airmail services based on PAA transpacific routes until the Japanese attack on Pearl Harbor on December 7, 1941.